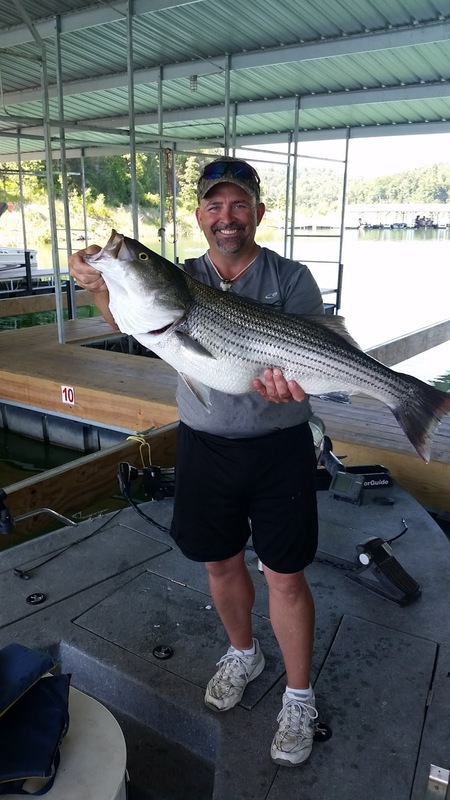 Norfork Lake's striped bass fishing is continuing to be very good. They have migrated to their beginning of summer pattern. 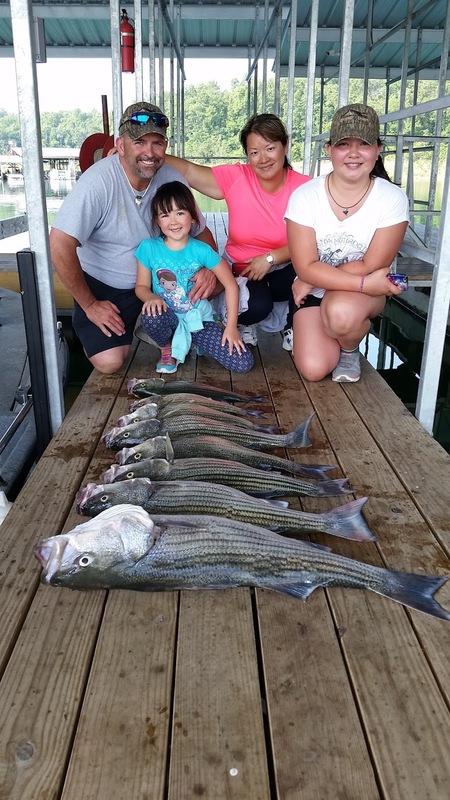 The striped bass are deeper and are being caught 30 - 50 feet down in all different water depths. I have caught them on the bottom in 40 feet of water and also suspended in 100 ftee of water. This morning I fished with my daughter and oldest granddaughter. We ended up landing 8 striped and hybrid bass in two different types of areas. One area was part way back in a creek and the second was on a main lake point. The two biggest fish were 23 pounds and 16 pounds striped bass, with hybrids up to 9 pounds and other stripers up to 10 pounds. All but 3 fish were released, as three would not swim away. Live bait is working the best for me, but I have been fishing with my grand kids and artificial bait makes fishing a little more difficult. All sizes of live bait is working from 3 inch thread fin shad on up to 9 inch gizzards. Vertical jigging with a spoon is also starting to work. Find the stripers on your electronics and drop a spoon to the fish and start jigging up and down. If you get into a large school of fish and they don't hit it while jigging, drop it though them then reel up though the school and be ready for a fish to attack the bait. But in my experience they typically hit it on the fall. Trollers are also doing good dragging umbrella rigs or swim baits. The main thing is to make sure your bait is 25 - 45 feet deep or just above the fish you are marking on your graph. Topwater for striped bass has stopped, but hybrid bass are still coming up early in the morning close to points part way back into creeks. 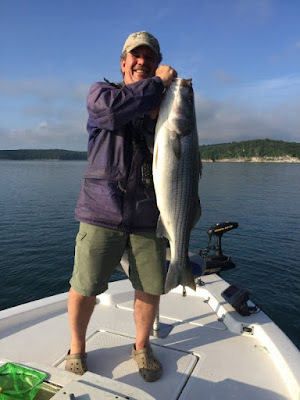 I am finding hybrids in the same locations as the stripers but they are feeding much higher in the water column, from the surface down to 20 feet deep. Topwater baits and swim baits are working well for artificial baits. Live bait is also very good by pitching them free line, meaning with no weight. 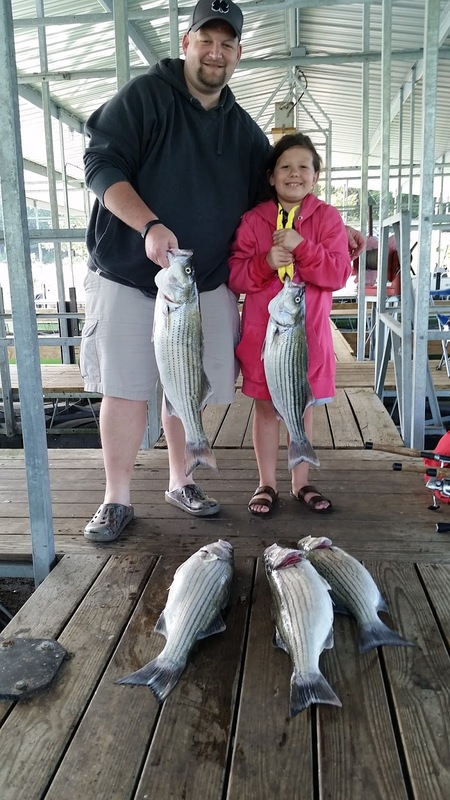 Best places to fish for stripers and hybrids are from the mouths of Big Creek and Brushy Creek to the dam as well as from the Bidwell area to the dam. Yes, they are scattered thoughout the entire lake. Largemouth and spotted bass fishing has also been good. 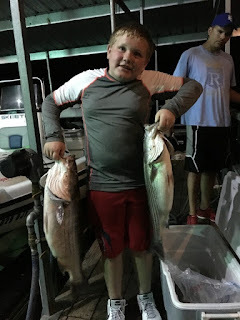 You will find topwater action early in the morning until sunrise in the same locations as the stripers then again in the late afternoon right before sunset. 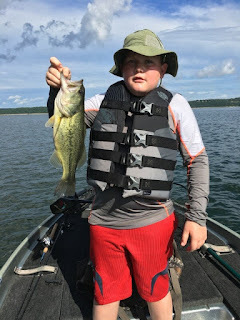 In the morning, once the sun gets above the tree line they will go down so start working the bottom from 10 feet out to 30 feet deep with your plastics or jigs. You can also work bush piles in the 20 - 30 feet water depth and catch some quality fish. I have been having too much fun striper fishing to go out crappie fishing, but anglers have been told me you can find some nice fish on brush in 20 - 30 feet of water back in the creeks. 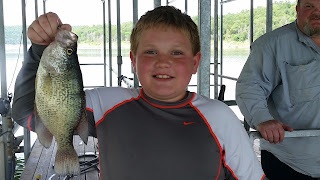 If you are staying at an area with a large boat dock that has some brush under it you can catch some really nice crappie pretty much all day long, when they decide to feed. 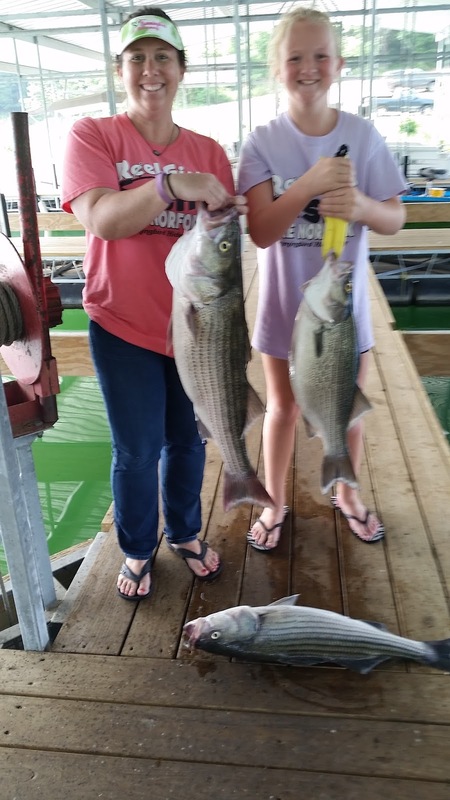 Our dock is producing some good fish in the 13 - 16 inch range. The lake level continues to rise slowly and currently sits at 556.98. Minimal power generation is occurring during the day and evening. The lake surface water temperature is in low to mid 80's, but varies depending on the location in the lake. The main lake is clear on the surface and the creeks and coves are stained, but appear to be trying to clear. I have been told a thermocline is forming, but I have not seen evidence of this at this time, but if not at this time we will have one very shortly with the warm temperatures. Happy fishing and see you on the lake.